Enjoy Exciting Daegu City Tour! 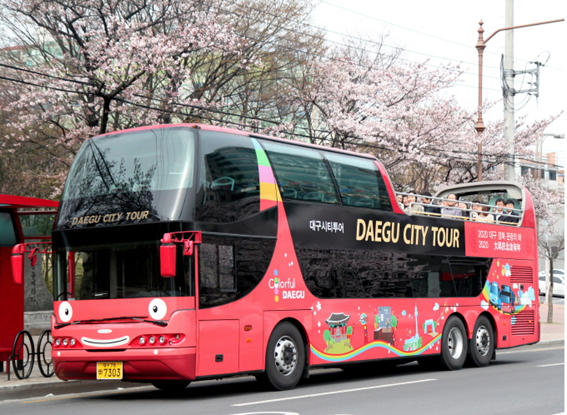 ○ From December 2018 to February of this year, Daegu Metropolitan City reorganized its city tour program, replacing vehicles, revamping signs, increasing the number of convenience facilities, to create an optimal service environment for the convenience of tourists from Korea and abroad. - For the convenience of foreigners, City Tour Guide Service has also been improved with the installation of multilingual audio guides (Korean, English, Chinese, and Japanese) on all vehicles. ○ Rather than providing simple sightseeing service, Daegu City Tour now provides various events and performances for the riders, attracting return visitors for fun and exciting experiences. - A number of events and performances have been planned for the City Tour Bus, which circles around the whole city, for every Saturday as the number of riders are the highest. Such efforts would help the Daegu City Tour to provide unforgettable experience to the riders. surprise events (proposals, Loving Family events, etc. ), etc. ○ The bus stops were also reselected, including popular attractions and sites such as Samsung Creative Campus, Daegu Opera House, Daegu National Museum, and Daegu Art Museum. In addition, transfers between themed routes and city center routes are available at Cheongnaeondeok Station, Dongdaegu Station, and Daegu Airport, for the convenience and broad selection of riders.